Stone house at the foot of the ancient fortress aldobrandesca. About 100 m2 seats on one level, two bedrooms, bathroom, kitchen and a large living room with large fireplace. Ceilings with exposed beams and original floors in terracotta, equipped with every comfort (TV, heating, wood for the fireplace) and furnished with furniture from rustic Tuscan art. On hot summer days you can climb on top of the caisson to relax in solitude and dominate a picturesque landscape where the view extends from the sea to the mountains. You can taste the local produce and have breakfast with milk from the farm's owner. Ottima sistemazione in un borgo medievale incantevole con un bellissimo panorama. Casa molto pulita e curata con un grande camino. Padroni di casa molto gentili e disponibili. L'ideale per chi vuole fare delle ferie in grande traquillità. Molto comodo per le terme di Saturnia, tra le migliori d'Italia. Un grazie ad Alessandra e a tutto il gruppo!! !Vi auguro un buon anno e spero di avervi nuovamente ospiti, la nostra casa-"cineforum" è sempre aperta!!! La casa è molto bella ed accogliente, arredata con gusto, immersa in un contesto molto pittoresco. Dalle finestre si vede anche il mare in lontananza, il monte Argentario e la punta sud dell'isola del Giglio. Saturnia è a 10 minuti. E' stata una ottima vacanza, breve, ma molto bella. L'accoglienza di Giada è stata ottima. Very special romantic place, small medieval village, perfectly clean apartment, nice and honest owner, comfortable beds and bath, full kitchen with everything what you need, homemade cake, jam and milk from the owner, air, birds (we did see the fox too), silence... 10 minutes to Saturnia and 3 minutes to Semproniano by car. Unforgettable experience! 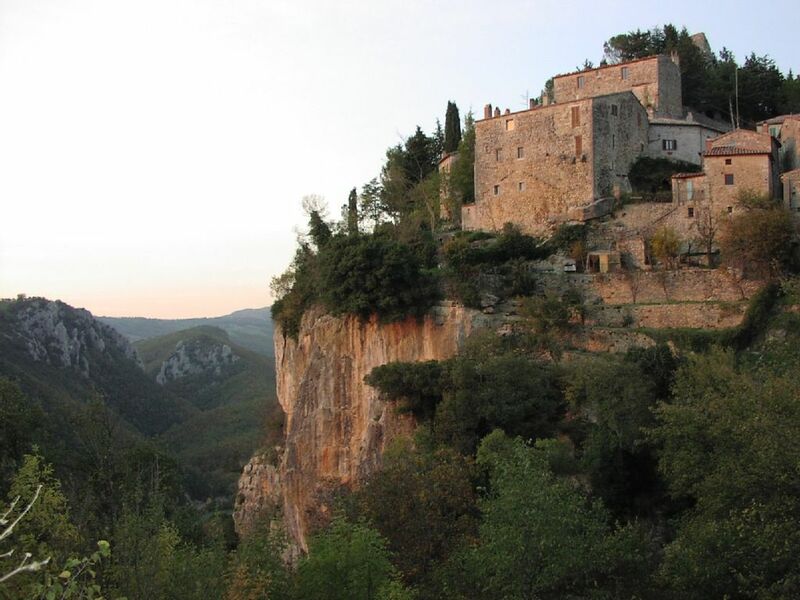 Small medieval village in the Maremma Grosseto, a few kilometers from the thermal waters of Saturnia; immersed in the wild countryside. The most important Etruscan sites of Tuscany can be reached in under an hour (Sovana, Pitigliano, Vulci, Tarquinia, Cerveteri). At the same distance, towards the sea, you can enjoy fantastic beaches. The climate becomes cooler continuing toward the peak of Amiata (1700 m above sea level reached in about half an hour). A dip in the past between history and legend, where time seems to stand still. You can regenerate from the stress of the city; no more noise of chaotic traffic but only the rustle of leaves blowing in the wind and the chirping of birds. 'I think this village rude, sour, cut off from the world, terribly quiet and peaceful, eagle's nest on the highest peak of the cliff that overhangs the river Albegna, escapes the knowledge of the most'. IL PREZZO DI € 70 E' INTESO PER L'INTERO APPARTAMENTO (2 PERSONE) € 10 per aggiungere il quinto posto letto SONO INCLUSI NEL PREZZO: -gasolio: -elettricità; -acqua; -pulizie finali. Per prenotazioni settimanali o mensili e' previsto il versamento di una caparra che corrisponde al 30% dell'importo totale. Per tali prenotazioni contattare il proprietario per il preventivo.